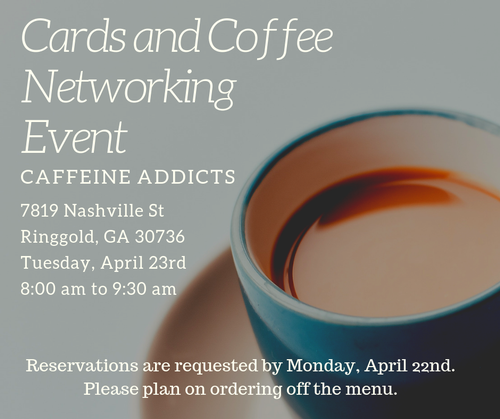 Chamber members, please bring your business cards and join us for Cards and Coffee Networking Event at Caffeine Addicts! At 8:30 will be doing a ribbon cutting for our new member Caffeine Addicts! No charge for this event but we do need your reservation by 4/22. Please plan to order off the menu. Reservations are required by Monday, April 22nd. Please plan on ordering off the menu.